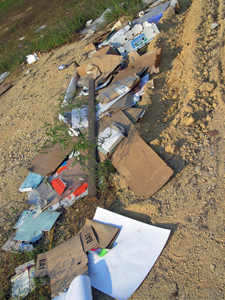 There will be a clean up of Newsom Station Road on April 17, 2010. The neighborhoods of Boone Trace, Lexington Point and Riverwalk will participate in the clean up. Metro Beautification and Environment Commission will supply t-shirts, gloves and trash bags to all participants. The event is part of the Great American Clean Up, sponsored by Keep America Beautiful. 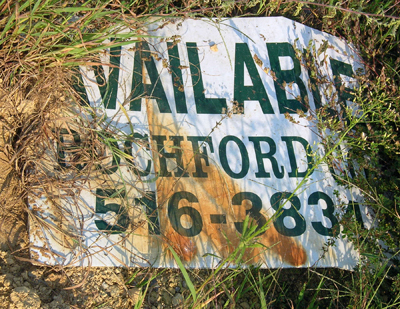 This trash was found in a field between Riverwalk and Lexington Point subdivisions in Bellevue, Tenn. The box is recyclable. Did the box just jump out of someone’s trash can? Recently I read in the Wall Street Journal about the letters that were being sent to Santa Claus this Christmas by children affected by the recession. Some of these kids are asking for socks and shoes; others ask for jobs for their parents. Then I see these toys left on the Riverwalk greenway. They have been there for several days. I do not know if they are still usable toys. Possibly these are broken. Please teach your children to take care of their toys. Do not leave them behind on the ground after playing with them. If the children have outgrown them, donate them to Goodwill or put them on freecycle.com for someone to take. Reusing is as important as recycling. Some paving has been completed in the Riverwalk subdivision. Should I suspect that this pile of asphalt off Newsom Station Road was left behind by the pavers? Recently I visited an abandoned construction site. Although the site has been cleaned up some since last year, there is construction trash thrown around the area. The site has been abandoned for over a year, but some of this trash looks recent. It’s not weathered or disturbed by wildlife. The site is on a hill in the Riverwalk subdivision. Although all the trees have been removed from the hill, it could be a beautiful area. I wish I had seen the area before the construction company did its damage. With our economy in shambles, I’m sure this is a site all over our country. The site has been abandoned for over a year.